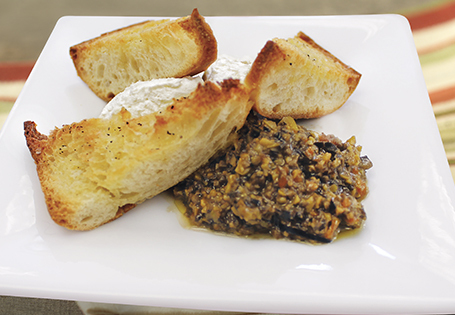 Simple homemade tapenade pairs perfectly with goat cheese. Pull apart bread halves and then slice crosswise into mini rustic crostini rectangles. Drizzle with olive oil and sprinkle with salt and pepper to taste. Spread on baking sheets and bake 10-12 minutes or until golden brown and crisp. For tapenade, place olives, 1/2 cup olive oil, vinegar, garlic, salt, pepper and red pepper flakes into food processor. Blend in short bursts until mixture comes together but there are still small chunks of olive. To assemble: spread a thin layer of goat cheese on each crostini and top with about a teaspoon of tapenade mixture.